You can make it the night before and pop it into your oven the next morning for an easy breakfast. And … yes … it is VEGAN. I have to give a huge shout out to my girl Alicia C. Simpson for her “Quiche Lorraine” recipe in the book “Low Fat and Low Cal Vegan Comfort Food“. That recipe was the inspiration for all the quiches and fritattas I’ve created since. I’ve twerked … err, I mean, tweaked … her quiche recipe so much there is no longer any resemblance, but still, that’s where my original inspiration came from! Thank you, Alicia! One block Firm Tofu (I used Nasoya), about 14 oz. Preheat oven to 375 and spray a 9-inch pie pan with cooking spray. In a blender or food processor, combine tofu, salt, black pepper, turmeric, ground mustard, granulated garlic, nutritional yeast, cumin, canola oil, and milk. If you really want it to taste like eggs, add a pinch of black salt. Blend. It doesn’t have to be absolutely smooth as long as it is well blended. It will probably be very thick, and you’ll probably have to scrape the sides of the blender down two or three times. Cook the sausage. I browned the sausage in a frying pan sprayed with olive oil cooking spray, to reduce some of the fat and calories. Brown until the sausage gets really done and just a little dry. Be sure to brown the sausage well! 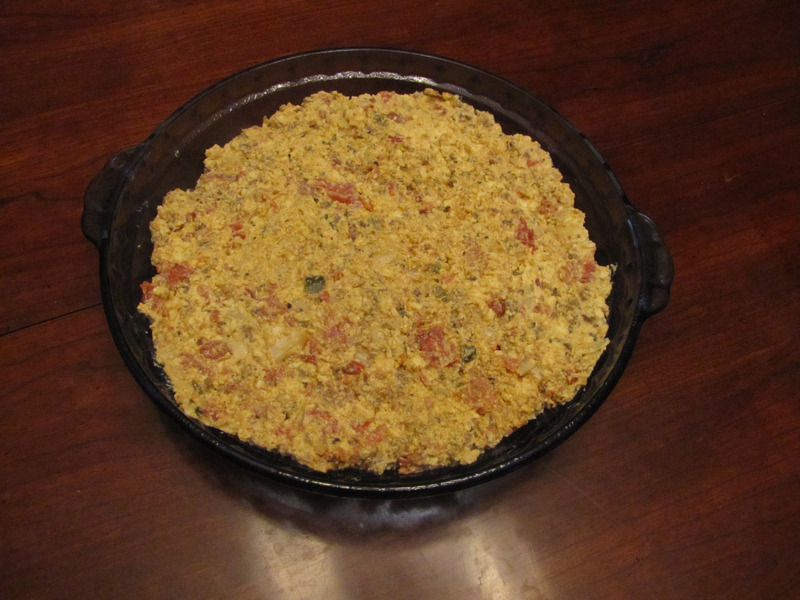 In a bowl, combine the tofu mixture with the chopped onion, cooked sausage, and drained Ro-Tel tomatoes. 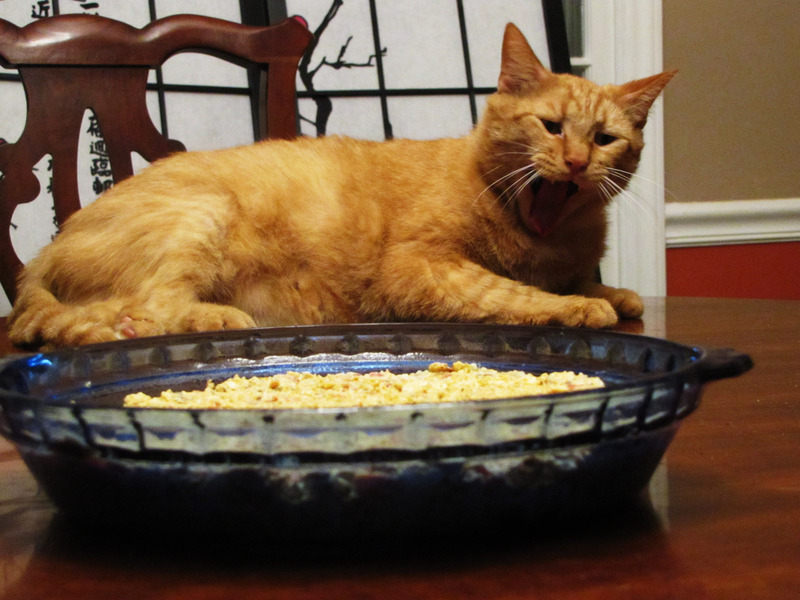 Stir until ingredients are evenly distributed. Pour into pie pan. Pat down evenly with a spatula. Cook in oven at 375 for approximately 45 minutes or until top of fritatta is golden brown. Remove from oven. Put a plate over the pie plan and quickly FLIP it over. 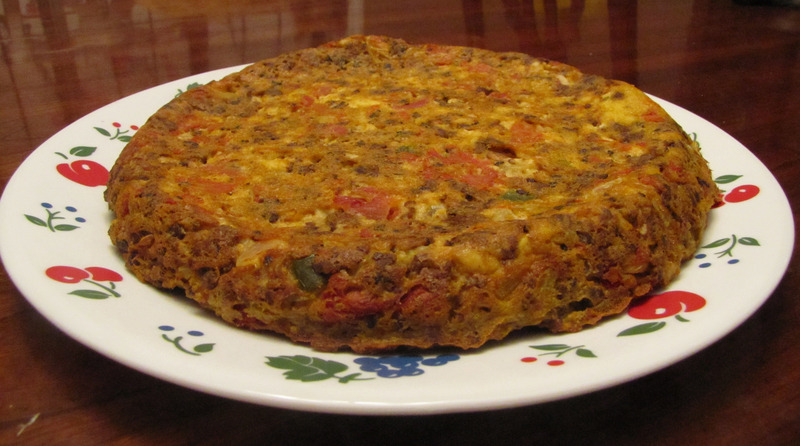 Let cool slightly, then enjoy your fritatta! If you don’t like spicy, try using a drained canned of Ro-Tel “Mild” tomatoes. If you really can’t handle any spice at all, substitute two diced Roma tomatoes. If you want a creamier, more quiche-like texture, simply use soft or silken tofu in place of firm. Follow the rest of the recipe, EXCEPT don’t try to flip it out onto a plate – it will fall apart. What kind of post would this be without a cat photobombing the picture? « Brunch at Bean With Special Guests The Humane League! 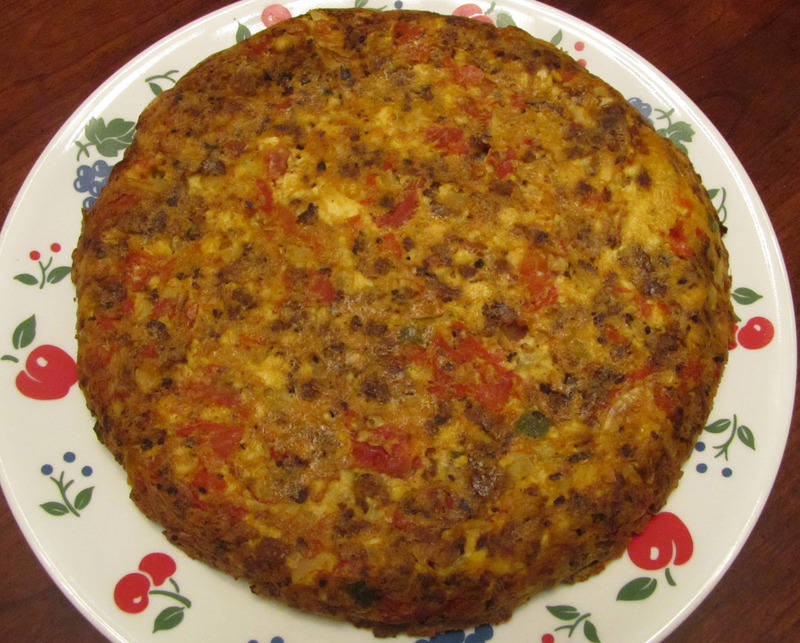 That fritatta looks so delicious and I will try it but plan to try to cook it on a campfire in a cast-iron frying pan. My vegan friend is coming to town and he loves it that I can always make something vegan over a campfire and my recipes have been pretty much the same of late, so I can’t wait to try it. It might fall apart, but oh well. I think you could totally do this over a campfire in a cast-iron pan! What a fun idea! 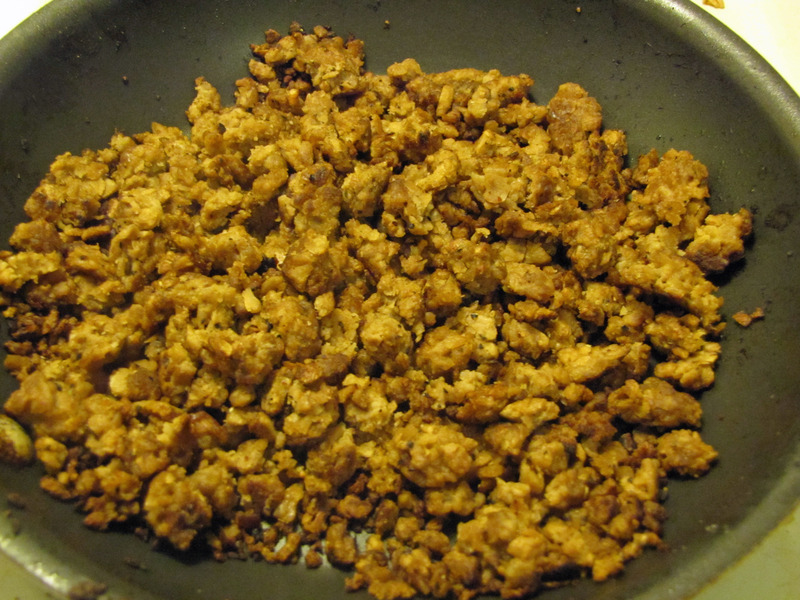 Even if it falls apart, it would still be a pretty good tofu scramble .. Let me know how that works out! Fabulous! I just made this today and, I must say, it’s wonderful. I don’t normally like the texture of dishes like this, but with all the chunks of goodies, it didn’t bother me at all. I wish I could say I shared it, but it’s rather lonely being vegan in Mooresville, lol. I’m so glad you liked it!! 🙂 I’ve been experimenting with fritattas and so far that’s my favorite combination. Btw, I substituted almond milk for the oil, as I try not to cook with it, and it was perfect. Thanks for the tip! The oil just gives it a bit more eggy texture and makes the nutritional yeast slightly more cheesy, but I imagine it would be good with just “milk”. I’ll try that myself on my next fritatta experiment!